I think at this point we just run a tabletop game with 7-9 very different players with different playstyles and let them create the new founding bloodlines and then build a new game from there. I swear, we could do it, all we need is our own lore. Imagine what would happen if we just did the basic opening scenario of a potential MMO... there is no vampire society at all, then 7-9 people are randomly embraced... what society do they form? what do they call themselves? do they align politically or by blood? Set in a modern/realistic world but darker and grittier. White Wolf/CCP owns none of this. The idea is to create a new modern horror, vampire based intellectual property that would be open for others to utilize. While there may be similarities between this new world and the World of Darkness, our goal is to use similar sources as White Wolf originally did (from Dracula and Anne Rice to Lost Boys and beyond) to build our own mythos, without copying from WW. To this end, the Creation Myth becomes important. Who were the first vampires? How might those first vampires shape the modern nights? While we could do what White Wolf did and design the world from the modern day backwards, it seems more organic to me to get players of different personality types and let them write or roleplay their creation stories, with the unique details that pop up in such stories providing the meat for the mythos of the modern nights stories and lineages. The creation stories would be a mix of myth and truth/reality. The idea would be to define a set of basic elements and mechanics and then let the players run with that. If we have few people interested we will probably ask people to write their origin stories and then edit them to make sure there are no glaring inconsistencies. Ideally, though, we'd have more players and we could do a sort of "Peer to Peer storytelling" to quote Rad, where if we had say 8 players, 4 would act as ST for 4 players and then we'd switch, and the former game runners would become the players. But before we can even start talking about the basics and mechanics, is anybody even interested? - How does creation work? - How does the blood bond work? - What powers do vampires have access to? - Are all vampires connected somehow or do they have individual creations mythoi? 1) Vampires are a predatory species, like lions. 2) Vampires are mutations, with powers, like in comic books. 3) Vampires are the next evolution of human beings. 4) Vampires are an alien species from outer space. 5) Nobody knows because none of the old vampires remember anything. What if it were okay that all of those were possible? There's no reason each origin story for each unique character can't be completely different. It will give anyone not from that lineage a chance to mock it, agree with it, or reframe it vis a vis the context of their own lineage's origin story. Rad was mulling over a more tribal, neolithic creator figure, whereas I was thinking more urban, cultural and (proto) Greek. Both might have wildly differing stories of how they became vampires. I'm kind of inspired by vtm to write something based in reality/history as setting so I am doing some mild research in order to write the progenitor's mythos/story for the lineage of vampires I'm creating: since the progenitor lived in the late neolithic period I have to know what the lifestyle was like then before inserting the hypothetical mythical/supernatural element that turned him into a vampire. @Rick I think all of the options you wrote could easily apply to Caine from VTM, the fun thing is that no one knows for sure. To Clarify: (after reading what Rick wrote below): I'm more in favor of multiple progenitors and multiple mythoi. For Vampire Pirates In Space! !, at the time I started writing the history (near-future), I was taking for granted that vampires had existed for the longest time, and that they had remained successfully hidden until this point in time when Mankind Needed Them (c). In my vampire version of events, vampires were more similar than different; in terms of VTM, every vampire had a few of the same Clan Disciplines (everybody gets Fortitude, Potence, Dominate, and for all intents and purposes, Presence), but there were different lineages that split off and developed their own powers, so you could tell lineages apart. Some just preferred using one style over another, as by the time the real setting of VPIS!! takes off, humankind has spread throughout the galaxy, and vampires have very distinct cultures that lend themselves towards different developments. Right now, I've effectively got Ventrue (the "Old Earth" lineages , who rule shadow kingdoms of the first and oldest Earth colonies), Gangrel-Lasombra mixes (feral pirates who breed and consume prolifically), the Ravnos (like the Gangrel-Lasombra mixes, only they're still sane), and the Tremere (while there's no magic in this setting, they constantly conspire to achieve technological and bio-cybernetic advances). But since vampires have more in common with another vampire than as seen in VTM, there are no official Clans or Bloodlines; you're re-created as a vampire first, and then your lifestyle corresponds with one of the major powers (being heavily influenced by who re-created you). Sort of like every vampire starting off as a Caitiff, and then joining a sect/covenant. But different. I didn't want to make hardline sects or covenants that were primarily one lineage or another ("Oh, you're from Old Earth? You must be XYZ! "); VPIS!! is much more about adventure and slightly more personal relationships than it is Sect vs. Sect warfare or worrying about the end of the world. The setting is bigger; the relationships are smaller. Perhaps the most relevant part of VPIS!! at this stage is whether or not you're/we're allowing alien species. If so, then the origin stories of that alien species could be one of the ones listed above. Human vampires were "cursed" somewhen back in prehistory; frog-alien vampires were evolutionary developments; hive-mind bug-alien vampires were deviant mutations; the Old Ones vampires are from Outer Outer Space and are alien to EVERYBODY. If it's a human-centric campaign without active gods, then I'd say they were a biological experiment gone wrong (meaning that they were a recent development; no earlier than the 1800s), or they began with a degenerate cannibal with aspirations beyond his station (that could go as far back as the tribal stage, when cannibalism became taboo. Maybe this proto-vampire was the REASON cannibalism became taboo. Just look what happens!). Even if we don't expand on VPIS! !, I kind of like the idea of a degenerate cannibal being the Originator. That taints the whole race of vampires forever, and encourages the view of vampires being violent, bloodthirsty, and all-consuming, instead of/in addition to being pretty-boy social butterflies. Cannibalism may be good starting point for whatever bloodline you develop but it has been practiced over thousands of years in numerous cultures that didn't become vampires (source: http://en.wikipedia.org/wiki/Cannibalism ) so what sets your type of cannibalism apart? - Cannibalism has already been associated with werewolves on number of IPs. - Vampire feeding shouldn't default to permanently kill/maim a person: some vampires should able to be on the moral greyscale from an ignorant-mortal perspective, and some of them should be able to play pretty boy social butterflies. Okay, so maybe not just ONE degenerate cannibal. There can be more degenerate cannibals around. 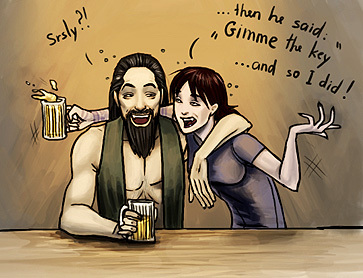 As they mention in Bloodlines there are blood-drinking cultures all over the world. You've got ancient Assyrians, the Aztecs, aaaaaand... Well, even the Mongols (of Asia) and Massai tribes (of Africa) drank blood concoctions regularly. Probably still do. Horse and cow blood. Mmm-mmm, good. One small step to some individual substituting the blood of living human beings. 1) So? Werewolves and vampires have a lot more in common than their feeding habits. The supernaturalness, for one. Association with nighttime. Violent tendencies. In quite a few cases, shapeshifting powers. Penchant for hanging out with scantily-clad female leads. Credited with Eastern European origins. 2) That's where the "refinement" of the vampire existence comes in. Maybe the next generation after the degenerate cannibal only felt the need for blood; maybe the next vampire re-created wasn't a cannibal in life, so they only got "half" the curse. They can still play the pretty-boy (if they must), because their physical appearance isn't changed so much. But on that note, I'd like to have a more concrete reason why vampires are stuck in physical stasis than, "Just 'cause". If in fact they are in our setting. There is a big difference between cannibalizing someone and drinking their blood. The fact that you can do one without the other alone is difference enough. Either way I don't think the progenitor I create needs to be a cannibal, its not really in his personality. Cannibalism and blood-drinking have more to do with one another than... just about anything else and blood-drinking. Murdering your brother doesn't translate directly into vampirism, either, but they pulled it off in VTM. Lots of people do THAT without turning into vampires. But there's got to be some change in the natural order of things for vampires to happen. Outright cannibalism makes a lot of sense: it's consuming something taboo to extend your own life. *though an extremely similar tact has been used in the Warhammer Fantasy setting. Not a whole lot to report as I'm still doing my research, but I think I'll be doing two since it looks like there aren't many of us interested at this point. So far it's looking like the first will be Greek (found some good Greek stories that involve the exact stuff I'm looking for, but the details still need to be worked out) and I found a great Aztec god to base things off of in that department but again, not sure of all the details yet. My next post will include more detailed info about both ideas. Actually Caine turned into a vamp from either the curse or for associating himself with Lillith(a witch/demoness of sorts), it wasn't the act by itself. Whats next someone turned into a vampire for drinking breast-milk as an adult? that is kind of taboo also. Look, If you want to make a Cannibalism progenitor good for you, it worked for Nagaraja, but I don't see why I have to adopt it into what I am writing? (I see cannibalism as more disgusting than scary/taboo) and what is wrong with blood drinking that you are so insistent on replacing it with cannibalism? This is precisely why one progenitor for everyone is a bad idea: Even in VTM there is no shortage of people who dislike the judeo-christian roots or this clan or that but the settings is very modular so they can be customized with plenty of equally canon alternatives. TL;DR: As far as I'm concerned we are not "settling on exactly who", because there is more than one. I am writing Northern Europe in the upper neolithic era which includes megaliths/weird stone markings, pagan mythology etc and plenty of room to expand on in later eras. I am slowly moving out of the research stage and starting to write stuff but other projects kept me busy. I think what is left to do is to mix things from these sources and rebuild them according to speculation based on these. I was the under the impression that this was going to be a single but collaborative project between a number of creative people (well, three so far). But if we're all going to be doing our own thing anyway, with separate origins and consequential plotlines, I'm goin' back to Vampire Pirates In Space!! and flesh that out a little more. Yes, it is collaborative, At this point I got the impression that we are all (2 of us it seems) doing research and working on different parts of the same settings ,after we see what we have we can critique and make changes if needed so it all fits together. The Mechanics intended to be common to all are the ones outlined by Nigama at the OP and what is a vampire in general but I do not expect that we would have to make big changes there from what we all already know. Also for consequential plot-lines I think it is abit early to tell. VTM had more than a few of these meta-plots and while it enrich the settings it also somewhat convoluted. Good luck with Vampire Pirates in space all the same. It is entirely possible that our separate lines of research (inspiration/cockamamie theory-crafting) will result in parallel and complementary ideas that can be combined. So while you two are doing all the hard work, I'm going to continue with my cockamamie theory-crafting and hope that it blends with Egyptian, northern European, and/or Aztec historical research! Yaaaaay! Founder: The leader of the asklepieion at Epidaurus (the most well known asklepieion in Ancient Greece), details of his change still fuzzy, but he found or was caretaker of Asklepios' formula to bring humans back from the dead. (Asklepios was killed because he was reviving people from the dead and Hades became upset. Zeus killed him with a lightning bolt, but Apollo created such a bother that Zeus resurrected him as a god.) However, either the formula used was incomplete or he/they substituted human blood in place of the blood of the gods ("ichor," which would normally be toxic to a mortal) [,or alternatively the blood of the Gorgon was the blood they were missing. Athena gave it to Asklepios so he could resurrect someone for her; the blood from the Gorgon's right side brought life, while the left side brought death. Same idea, they used mortal blood instead of Gorgon blood.] The result was that he rose from the dead, but was cursed by Hades. ?? Possible connection with Founder to Cadmus, who founded Thebes, taught Greeks the Phoenician alphabet, slayed a serpent, only to be eventually turned into a serpent. Also, Cadmus seems to be associated with this pre-Greek pantheon group of gods called Kabeiroi, which probably would have belonged to the sailors that spread FROM Phoenicia, which brings us back closer to the weird gods of Mesopotamia. The Kabeiroi religion was super secretive and somewhat dark, which serves my needs nicely. I'd like to tie this in somehow, but Cadmus is FAR before the worship of Asklepios (Asklepious is worshiped in Ancient Greece, Cadmus is a founder from Mythological Greece). 3rd possibility: Asklepios apparently raised three people from the dead... Hippolytus who had sworn chastity to Artemis, goddess of the hunt. Lycurgus, a King who died in battle. And Capaneus, a physically powerful but arrogant man killed by Zeus for his arrogance. Each lineage could reflect the outline of the one listed overall here but those descended from Hippolytus would be more predatory, perhaps heavy agility/speed, Lycurgus could focus on toughness, control of others, Capaneus could focus on strength, toughness and be very arrogant. Associated Animals: Snakes (non venomous snakes seen as instruments of healing), Crow (Apollo turned crows black (they were formerly white) because they delivered news that Asklepios' mother was cheating on him, for which Apollo also killed her before removing Asklepios via C-section, hence his name "to cut").